The best stories are in our history. That's what I've learned in my third career as a historical researcher, writer and presenter. Across Western New York, I find the influences of the past in our present. My curiosity drives me to find out who influenced us and how. I hope you will find these stories interesting, perhaps inspiring you to become an influence on future generations. And, if you have a good story that you think should be told, will you contact me? 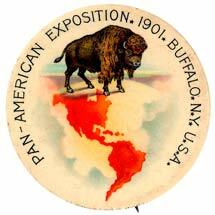 I have another web, "Doing the Pan," which contains my 16 years of research so far into Buffalo's 1901 Pan-American Exposition. It is a continuing project. Take a virtural tour! Below are the presentations I am currently scheduling to interested groups. Please contact me for more information or to arrange a presentation to your group. Everyone knows the Statler Hotel in Niagara Square. Few know that E. M. Statler built two other hotels in Buffalo, a ground-breaking restaurant, and a grand estate on Soldier's Place. He was not born in Buffalo but decided that booming Buffalo in 1896 shared the same attitudes as he and so he moved here to grow with the Queen City. This presentation illustrates the parallel evolution of E.M. Statler and his adopted city from 1896 through 1925. Powerpoint with lively narration. 40 Minutes. 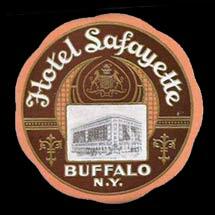 The Lafayette Hotel had a difficult time getting built but it had a long, illustrious, profitable history for its owners. 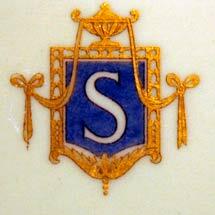 It was the place to stay for visiting dignitaries for much of its history. What was its original beauty, how did it change with the times, why did it fall on hard times, and how was it re-imagined by a local developer? Includes rare early photos of the interior and present-day before and after photos of the restoration. 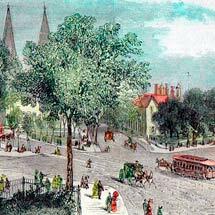 People think of Niagara Square as the location of large city, state, and federal governmental buildings, but in 1820 it was a suburb of the village of Buffalo, a crossroads hidden among old-growth trees. Learn how it became a handsome residential neighborhood for a handful of Buffalo's leaders and then evolved into the center of the growing city's charitable organizations. See how Frederick Law Olmsted circled the Square and marvel at the nearly unanimous decision by Buffalo's citizens that the heart of it was the perfect location for a memorial to the President who was assassinated in Buffalo. The city's movers and shakers made history in Niagara Square. Powerpoint with lively narration. 45 Minutes. "Do the Pan" the way 1901 visitors did. Through their words and pictures, see what they saw. Bring the child in you to the sunset hour when the "Rainbow City" became the "City of Light". The “Eager” young men, like Laurence Dana Rumsey and Harry Ramsdell, Jr. went abroad as early as 1915 to volunteer as ambulance drivers with the American Field Service. Others volunteered for ambulance duty as soon as the U.S. entered the war in April 1917. The “Willing” were career soldiers such as Akron native Dennis Nolan, a West Point graduate who would end his service in the war as a Brigadier General. Others from around Western New York were called up immediately when war was declared because they were National Guardsmen with the 74th or 65th Regiments. And William Donovan of Troop I, New York State Cavalry, transferred quickly to the 42nd Division, the “Rainbow” division, in order to go abroad as soon as possible. The “Reluctant” were part of the 2.8 million men called up through the draft, instituted on May 18, 1917. They were young men for the most part, and reported for duty when asked, in what would be an unforgettable introduction to war on an industrial scale. WNY women who went abroad were varied in their background and motivations but felt compelled to find a way to help the French and British armies, the Belgian and French refugees, and later the 4.7 million American “Sammies” who joined the war in 1917. About all these volunteers had in common was that they were single, educated, and most were from well-to-do families. 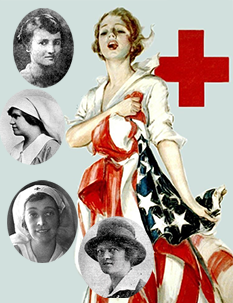 Listen to Alice Lord O’Brian and Anna Perit Rochester as they describe opening the first Red Cross Canteens in 1917, serving French soldiers until the Americans arrived. Enjoy Doris Kellogg’s exuberance over being able to assist in a hospital and canteens. And see how Mary Belknap’s experience with the wounded and her own struggle with the pneumonia that accompanied influenza drove her to come home to Lockport as soon as possible when the war ended. In a class by themselves, early WNY volunteers for aviation served primarily with the French in the Lafayette Escadrille. American squadrons were formed after April 1917 but organizing, training, and equipping the new Army Air Service took so long that only 45 all-American squadrons fought in France by the end of war. See how John Knox MacArthur, Nathaniel Duffy, Laurence Dana Rumsey dared to fly their “peach crates” in dog fights with the superior German pilots. Learn how Buffalo’s Aero Club and the Curtiss Aeroplane Company helped move WNY into the forefront of aviation. Copyright © 2018 Susan J. Eck. All Rights Reserved.